When storing hazardous materials it is important to take necessary precautions. Storing and handling hazardous materials can pose serious health risks if the proper safety techniques are not followed. Chemical storage shelves and chemical storage accessories are necessary when compliantly storing hazardous materials safely. Understand safety regulations and requirements when storing chemicals. Containers should be labeled and dated for storing and handling purposes. If a chemical container does not have a label on its exterior, contact the distributor or manufacturer to get a new label. It is recommended that chemical storage shelves are used for enhanced chemical storage organization. 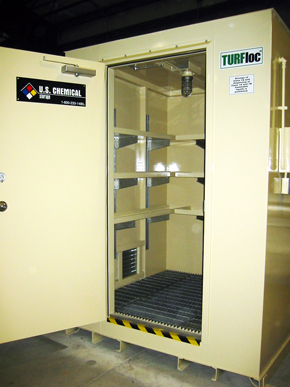 Chemical storage buildings by US Chemical Storage feature a compliant secondary sump containment in case of accidental spills or leaks. Secondary sump containers provide increased protection and safety when storing hazardous materials. Chemical storage shelves by US Chemical Storage offer increased organization, safety, and security when storing chemical inventory. Choose from a wide variety of chemical storage shelves to make your chemical storage compliant and safe. Stainless steel shelving, sump containment shelving, fixed shelving, adjustable shelving and more! Chemical storage shelving should be durable enough to withstand years of use, and strong enough to support and effectively secure your chemical inventory. Creating a safe storage area for your hazardous materials is a priority. When it comes to chemical storage shelving, our variety of shelving provides the advantages for safe, compliant and secure chemical storage solutions. Compliant chemical storage buildings by US Chemical Storage offer ultimate protection for personnel, investments and the environment. Chemical Storage buildings by US Chemical Storage provides 100% customizability to meet any specific requirement necessary. All of our chemical storage buildings are tested before they leave the factory for complete quality assurance. Our chemical storage lockers meet and exceed all EPA, OSHA, NFPA regulations and Warnock Hersey standards or FM Approvals. Fully compliant, heavy-duty chemical storage buildings for 100% compliance. Exceed your goals with a chemical storage building from US Chemical Storage. Our Strength is Your Security.